The British Business Bank’s Enterprise Finance Guarantee (EFG) facilitates business finance to smaller businesses that are viable but unable to obtain finance from their lender due to having insufficient security to meet the lender’s normal requirements. Since its launch in 2009, EFG has supported the provision of over 30,000 business loans to a value of over £3.2bn (as at end of June 2018). looking to scale up and grow. We are currently looking for new lenders to become partners in the Enterprise Finance Guarantee programme. Find out more here. 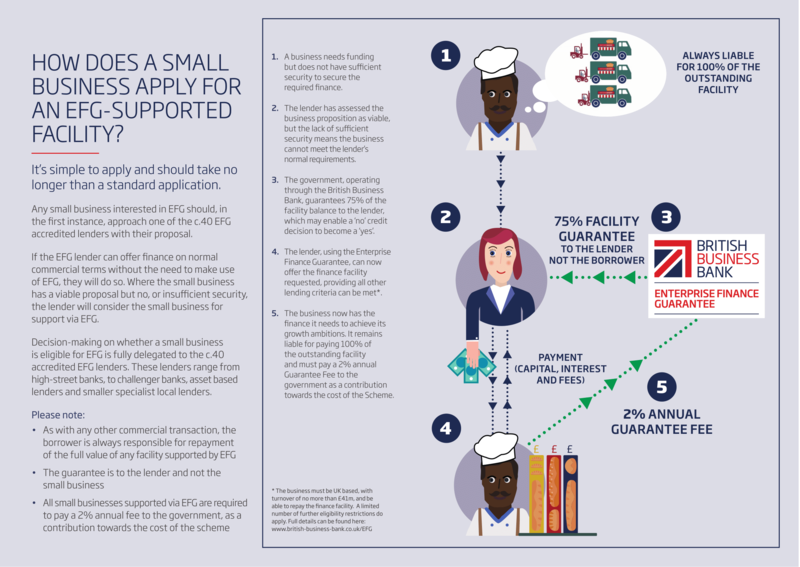 Facilitating lending to the UK’s smaller businesses. Find out more about the EFG scheme and how to apply here. EFG is managed by British Business Financial Services Limited, on behalf of its sponsoring department, Department for Business, Energy and Industrial Strategy (BEIS). * As at October 2016.